So the other day I made a batch of my Homemade Nutella. I had this recipe in mind when I made it. 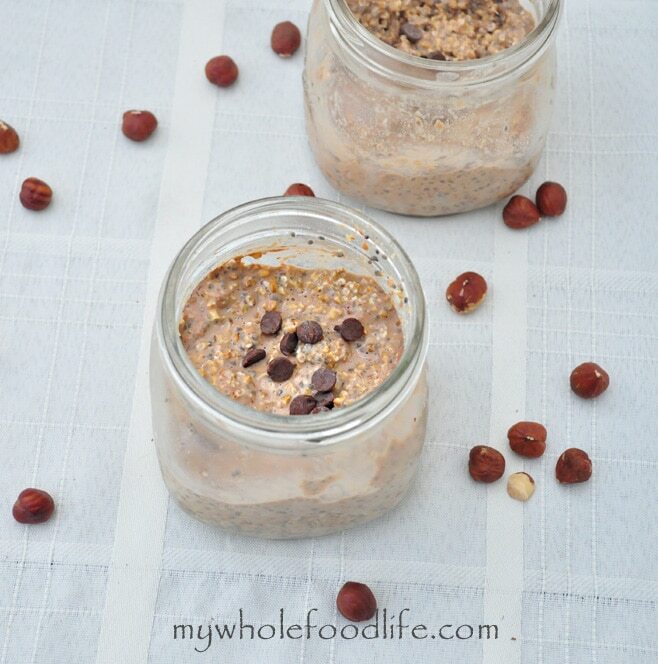 So now I am sharing these Nutella Overnight Oats with you! This recipe is just as easy as all the others. So good! I didn’t even add any extra sweetener to mine because the Homemade Nutella is already sweet. If you like things a little sweeter, I will put an option in the ingredient list. Combine all the ingredients in a jar and mix well. I make 5 at a time so I have easy breakfasts all week. I eat mine cold, but if you like yours warm, feel free to heat it up. Either way works. Enjoy! Thank you for these recipes. I've been making the overnight oats for about a week now. They have been a hit with my grandchildren. Their favorite so far is the apple cinnamon, but they also like the pumpkin. I used the pumpkin pie spice as opposed to the individual spices. A little less "spicy" for them. I tried the vanilla coconut this morning and enjoying it as I'm typing this. My favorite so far! The nutella will be next. Thank you! Thanks for these great recipes. Trying to get my kids to eat these, but they are not fans. Wondering how your kids like them? Maybe I am not adding enough milk - do you use the unsweetened almond milk? My younger daughter likes them, but my older daughter does not. You can add more milk if it's too thick. I use unsweetened almond milk. Did you ask them what they didn't like about them? I'm wondering how many calories is in one serving? If you did not add the optional sweetener, it would be about 475 calories. If you add in the optional sweeter, you need to probably add an extra 60 calories. Please keep in mind these are rough estimates. You, guys, definitely like overnight oats. :) Homemade nutella sounds awesome! Thanks Olena! My readers keep asking for new recipes. I guess the overnight oats are a hit with many. Oh yum!! I haven't had overnight oats in a really long time, and now I can't WAIT to make them again..starting with this one ;). And as for the homemade nutella, who knew it was that simple to make! Just 5 ingredients? awesome. Whoa this could get me out of bed in the morning! Yum! Ugh, I LOVE overnight oats. I seriously miss them since embarking on the candida cleanse. I've never heard of overnight oats before I found your website last week and I've never loved oatmeal but I'm obsessed with the overnight oats! My grocery list last week and this week were all recipes from your site. Thank you for the wonderful recipes! Can I use plain milk instead of almond milk? I ve never made overnight oats and and want to try this badly :). You can buy both at any health food store. You can also omit them, but I recommend decreasing the amount of milk if you choose to omit. If I use steel cut oats, would I need to cook them before making the recipe?? No. I use steel cut oats all the time for these. :) They will retain a slight crunch, but I like that.